NUFC: Do You Believe In Miracles? Yes! On a chilly Wednesday night in London, Newcastle United fielded 2 starters against Chelsea's 4 starters, and won a thriller, 4 goals to 3, to advance to round 4 of the Carling Cup. It was both shocking and extraordinary, not unlike the Red Sox victory over the Yankees in the 2004 ALCS. It was without question, the greatest reserves game I have ever seen in my 8 years of watching televised English football. I can only add a few opinions before I do a roundup of what the more seasoned bloggers said. Namely, I think Ryan Taylor proved that he deserves to start in a premiership game in the midfield over James Perch. As much as I like Perch and how he has improved game over game, he doesn't provide the offensive spark that Taylor provides. Taylor should be in at the start of every game this season. Along with a healthier Lovenkrands, Taylor would deliver more quality free kicks, assists, and goals. Perch, Smith, Jonas, and Barton can be used to fill the other two spots. Newcastle United now has a deep midfield. That's right! And they will soon have five strikers available. Their names are Carroll, Smith, Xisco, Ranger, and Ameobi. Some would chuckle at the fifth name. 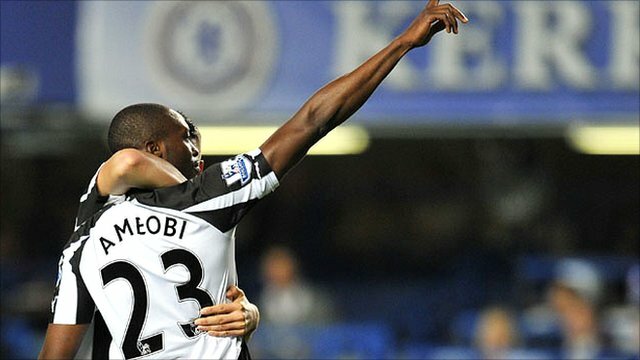 But as I have maintained all along, Shola Ameobi is a true Geordie and was the hero yesterday in a game full of heroism. You know how Yankee fans joke about how a player becomes a 'True Yankee?' I think Ameobi became a 'True Geordie' six years ago against Liverpool, and I think the fans who held out on that judgement became believers last night. Shola Ameobi is a True Geordie. Forever. But I must admit, I would never have thought that the Lads would convert a corner with Jonas kicking and Ameobi heading. No way. That would never happen. That did not just happen, did it? I don't know what was sweeter, seeing Shola score two goals, or seeing Chelsea fans leaving Stamford Bridge during the ridiculous six-minute injury time. Shola's first, jaw-dropping goal. Chelsea's Alex underestimated him. Many have. Shola on his second, game-winning goal. Shite Seats: "It was truly an astonishing evening of football"
Black & White & Read All Over: "the morale boost that this victory brings should hopefully carry through into our next couple of performances." The Chronicle's Blog on The Tyne: "An incredible night at Stamford Bridge that will surely go down as one of the most memorable matches in the club's history."